I had a recent conversation with Suzanne McNeill, CZT who has published 12 books over the past 2 years on Zentangle® method of drawing and Zentangle-inspired art. My work appears in Zentangle 5 and in both Zentangle 7 Zendalas & Zentangle 8: Monograms & Alphabets and The Joy of Zentangle, in addition to a Zentangle On Silk You Tube video also produced by Suzanne’s company. Suzanne’s books and publicity have been instrumental in making Zentangle popular and I am honored that she has agreed to teach a Zendala mini-class at the Marketing Retreat for Certified Zentangle Teachers on Labor Day weekend 2012 – see the YouTube video HERE. A Zendala is a term coined by the Zentangle Corporation that is a Zentangle in the form of a mandala. The patterns are drawn to fill each section of a circle. Joan started this Zendala in one of my classes! Mandala circles have been used to connect the spirit with the divine for centuries. They offer symbols found in nature as subjects of contemplation. These circle provide an opportunity to explore oneself through ancient teachings. To create a Zen Mandala, you need only a circle template, a pen and your creative imagination. There are also pre-printed Zendala tiles available for purchase through any CZT (Certified Zentangle Teacher) or the official Zentangle website. 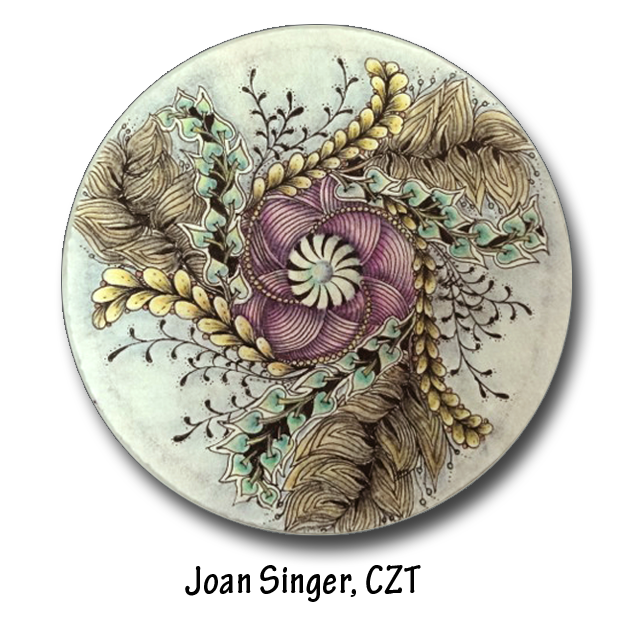 The samples above were created from the Zendala collection by the Zentangle Corporation. A set of pre-printed tiles includes 2 tiles each of 9 different designs plus 3 blank round tiles. For optimal pattern choices, take a class from a CZT in your area. Zentangle and CZT are the registered trademarked intellectual property of Rick Roberts and Maria Thomas. For more information about Zentangle, please visit Zentangle.com.